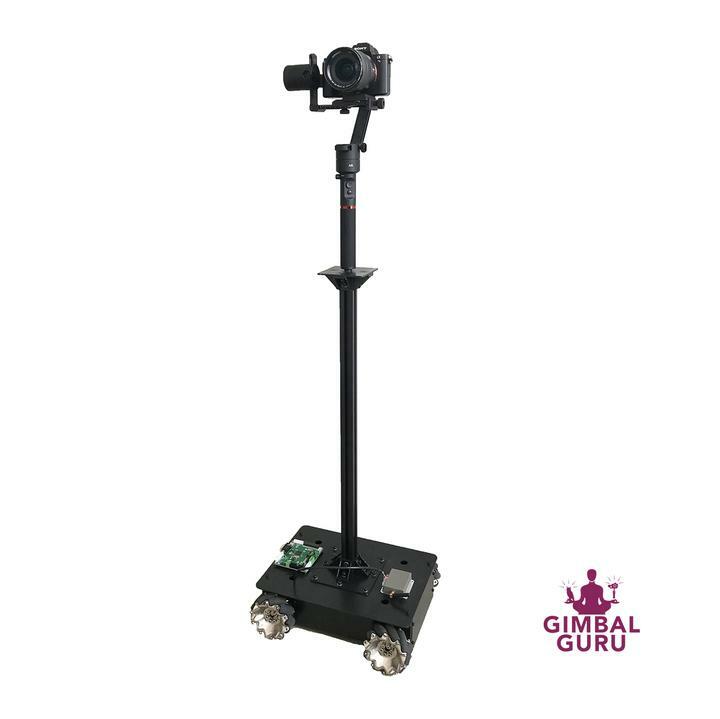 At NAB Show 2018, GimbalGuru announced the new Guru 360 Rover, a remote-controlled dolly for 360 and non-360 cameras up to 9 kg (20 lbs), that moves in any direction instantly (even laterally) as if by magic, thanks to its mecanum wheels. UPDATE: Check out a video of the Guru 360 Rover in action (thanks to Kevin Kunze)! There are several dollies in the market but they all use conventional wheels. Among other things, this means they cannot instantly move in an arbitrary direction. For example, if a 4-wheeled dolly needs to move left, it has to first turn into that direction. Similarly, the Guru 360 Rover’s omnidirectional wheels allow precise movement, without the need for tracks. Another benefit is that the nadir profile is constant. With conventional wheels, the wheels will turn left and right whereas with the 360 Rover, the wheels always present the same profile in the nadir of a 360 video. – Weight (with batteries): 14.8lbs / 6.7kg. – Maximum payload weight: 20lbs / 9kg. – Maximum Rotation Speed 140 degrees/s. – Battery life: running time 10 hours or 30 hours on standby. Guru 360 Rover is available for preorder from GimbalGuru for $5,999. I will try to get a video soon, including a sample 360 video made with the Guru 360 Rover. Mic Pretty cool! What we need is a cost effective dolly (robot) that will have a stabilized upright pole for doing 360 Video. There are VERY expensive robots out there but folks who even have the money to buy an Insta360 Pro or something similar are most likely not going to spend the big $$$ on what is out there. I am going to try and take two 4th Axis gimbals and turn them vertical to stabilize the 360 Camera support pole from “pole wobble”. I hope you can come across a good, cost effective solution for this because it is 100% missing from the market. Just think, if you have a totally stabilized robot base to moving the 360 Camera around on remotely, now you can do some serious 360 video. The Insta360 Pro does not need a gimbal, it needs a VERY stabile upright pole that does not vibrate or wobble. I will keep watching your post and hopefully you come across something that fits the bill! Thanks again for all the info you give us. Thank you very much Tim! I completely agree with you! Actually I’ve been searching for something like that too, and trying to make a DIY dolly that would cost maybe $500 or so. As for stabilization, I think the easiest solution for a low-cost dolly is to use a stabilized 360 camera such as the GoPro Fusion. Anyway don’t worry I haven’t given up! can be controlled by an IOS app…..
Hey Mic, check this out! This is the same technology. Maybe this forklift is cheaper than this!